One of the greatest movies ever made, Breathless, upon its release, revolutionized motion pictures forever, and has established itself as a cinematic as well as a cultural icon. The seminal work of Nouvelle Vague or the French New Wave movement, and former Cashiers Du Cinema critic and the great French intellectual Jean-Luc Godard’s audacious debut feature, Breathless is a treatise on existentialism, love and betrayal; it is also a clever rework of as well as a loving homage to the popular American genres of gangster and film noir, and the prevalent pop culture. The characters of the movie’s protagonists – Michel, a casual gangster who likes imitating Humphrey Bogart and on the run after killing a cop, and Patricia, an American girl who sells New York Herald Tribune in front of Champs-Elysees in Paris, are as well etched as that of the city of Paris, evocatively photographed in grainy black-and-whites. The jagged narrative, sudden jump cuts, characters speaking to the camera, deliberate distortion of spatial uniformity, adlibbed dialogues – these are but few of the legendary signatures of the film. 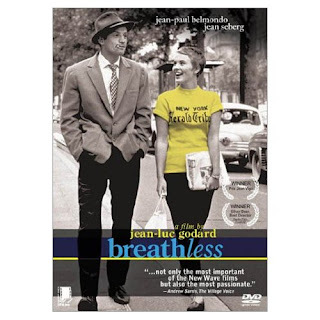 Godard’s great contemporary Francois Truffaut (who, incidentally had written the story for the movie) aptly summed up the movie’s immense stature when he famously stated that, “There are movies before Breathless, and there are movies after Breathless”. Touché. This is where it all started. Godard would be continually topping this film throughout his career, and as such it holds up primarily as a first foray into tentative aesthetics and ideas that would be further developed by the great director throughout the 60s and beyond. It remains a fine film, mainly for the strength of the two leads, and the cameo by Jean-Pierre Melville signals similar self-conscious film references ahead for other directors like Fritz Lang and Samuel Fuller. Seberg is great in this too, almost as good as her phenomenal turn in Preminger's Bonjour Tristesse, the film that made Godard want to use her in the first place. Godard famously said that his film was a continuation of her role in the Preminger film, and that you could imagine Breathless picking up immediately after the other film ended. Thanks for your insights - it was a really wonderful read. Looking forward to more of these from you. You are right, this is where it all started. If one had to select ten movies to capture the history of cinema, i'm quite certain this would have to be one of those.